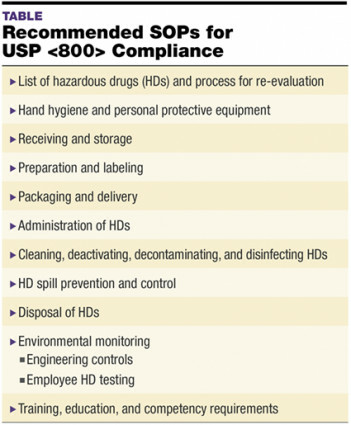 Achieving and maintaining compliance with USP General Chapter <800> Hazardous Drugs—Handling in Healthcare Settings is a continuous effort that requires unremitting attention and maintenance, including staff training, performance review, documentation, and quality improvement efforts. Developing comprehensive policies and procedures (P&Ps) and standard operating procedures (SOPs) is critical to ensuring compliance with the chapter (see TABLE: Recommended SOPs for USP <800> Compliance). It is not uncommon for there to be a lack of understanding in hospitals and health systems regarding the distinction between P&Ps and SOPs. However, as departments grow and organizations develop into true enterprise systems, awareness of the difference is important. Pharmacy P&Ps describe rules, positions, or a broad overview of important matters affecting the department. P&Ps are meant to remain in place for a significant amount of time and adjusted periodically based on changing vision and goals. They typically describe what and why pharmacy operates in a certain manner. Conversely, SOPs are specific descriptions of duties or responsibilities, and are intended to provide more detail for those following P&Ps. SOPs describe who, when, and how work should be done. The differences between P&Ps and SOPs become increasingly evident as departments seek to attain and maintain USP <800> compliance. While both P&Ps and SOPs are necessary building blocks to ensure safe, accurate, and efficient pharmacy compounding, a surprising number of pharmacies choose to only create P&Ps and disregard the need for SOPs. This approach is shortsighted, as delineating the exact procedures required to address various tasks is just as critical as developing policies (ie, the what and why). Critical elements to devise at the outset include a standardized SOP format, accessible storage location(s), staff training requirements, a regular SOP review schedule, and the establishment of a multidisciplinary team. Although multiple formats may be utilized for SOPs, it is critical that the format chosen be consistently used across the department. For example, establish whether process steps are to be numerical or graphical, utilizing a flow chart. A standardized format ensures uniformity, which will be appreciated by the staff. Both P&Ps and SOPs should be stored in an area that is readily accessible to all staff who may use them. Accessing this information should be sufficiently convenient so that staff does not feel a desire to bypass the information because it is difficult to retrieve. SOPs stored online or printed and stored in a binder close to the operational area have historically been the best options. Another consideration is whether SOPs should be accessed onsite-only or both onsite and offsite. Staff and administrators may occasionally require offsite access to P&Ps and SOPs for compliance purposes; these may most easily be accessed online. When frontline staff have questions about the who, when, or how, ensuring easy access to SOPs is a simple way to help ensure established practices are consistently followed over time. Thorough staff training and clear communication are critical during SOP implementation to lay the groundwork for success, particularly when SOPs impact multiple disciplines. Post-implementation, managers can utilize checklists and sign-off sheets to reinforce staff compliance with correct processes. A complete SOP review should occur annually and whenever pharmacy undergoes significant changes, such as a physical remodel of the pharmacy, switching to a new electronic medical record, implementation of new automation, or a change in staffing levels. SOPs can be reviewed on a rotating schedule throughout the year, or performed all at once at year’s end. The process for reviewing SOPs and the specified frequency should also be included in the SOP. In the pursuit of USP <800> compliance, a multidisciplinary approach is ideal. To effectively evaluate each step within the medication-use process, convene a team approach that includes pharmacy, nursing, medical staff, and environmental services or waste management. It is critical to recognize that USP <800> compliance and appropriate hazardous drug (HD) management neither begins nor ends at the pharmacy door. To view West Virginia University Hospital’s approach to developing USP <800>-compliant P&Ps and SOPs, see the SIDEBAR. Daniel P. O’Neil, PharmD, MS, BCPS, is the assistant director of pharmacy at West Virginia University Medicine. He completed his PharmD at Lake Erie College of Osteopathic Medicine and his MS in health-system pharmacy administration at the University of North Carolina Eshelman School of Pharmacy. Jordan Carter, PharmD, MS, is the operations pharmacy manager at West Virginia University Medicine. He completed his PharmD at the University of Kentucky and his MS in health-system pharmacy administration at the University of Kansas. West Virginia University Hospital (WVUH), the flagship campus of WVU Medicine Health-System, operates a 710-bed facility located in Morgantown, West Virginia, which includes numerous ambulatory care clinics. In 2015, when drafts of USP <800> were first released for public comment, the health system began exploring a new strategy to ensure safe hazardous drugs (HD) handling for all staff involved in the medication-use process. The first step was convening an interdisciplinary team, which met monthly to develop a comprehensive HD P&P that covered each aspect of the medication-use process. The facility’s HD list was reviewed and updated based on USP <800> and National Institute of Occupational Safety and Health (NIOSH) recommendations. The list is now evaluated at least once each year, as well as each time a new drug or dosage form is added to formulary. Once the P&P was established, we conducted a gap analysis based on the most recent version of USP <800> so that SOPs could be prioritized and developed (see FIGURE). All aspects of the medication-use process where HD risks were identified were assigned priority status in the development process. SOPs are reviewed at least annually or whenever there is a practice change. Traditionally, SOPs that affect only one designated area are reviewed during working meetings with pharmacists, pharmacy technicians, supervisors, managers, and medication safety officer(s). Policies encompassing multiple disciplines are routed through an interdisciplinary medication safety committee or another sub-committee of pharmacy, nutrition, and therapeutics. As the WVU Medicine Health System continues to expand, we are experiencing increasing pressure to standardize formularies, electronic medical records (EMRs), and practices. In these efforts, the differences between P&Ps and SOPs become truly relevant. While the HD P&P does not yet reflect a true system-wide policy, we have successfully standardized our HD list in the EMR throughout the health system. Because procedural challenges still exist at various institutions throughout the health system, moving forward, establishing SOPs to ensure USP <800> compliance will be extremely important. Fortunately, our organization has invested in completely remodeling three of our parenteral product distribution areas over the next 3 years. The Mary-Babb Randolph Cancer Center, Central Inpatient, and Pediatrics Pharmacies will be moving into new spaces to coincide with the December 1, 2019 enforcement date for USP <800>. These renovations, along with further enterprise systemization, will drive ongoing refinement of our SOPs.